How Much Do Super Bowl Halftime Show Performers Get Paid? Sure, the biggest event in football is technically for football fans, but the truth is there's something for everyone. There are nachos for the hungry. And there's booze for thirsty. And there are the commercials for those who prefer a little less violence and a little more shenanigans. And finally, there's as much razzle and as much dazzle as anyone could ever hope for during the beloved Super Bowl half time show. On Sunday, the New England Patriots will face off against the Los Angeles Rams in Super Bowl LIII, but we all know what the real show is. Who is performing at the 2019 halftime show? The main acts this year will be Maroon 5, Travis Scott, and Big Boi (but there could be surprise guests). 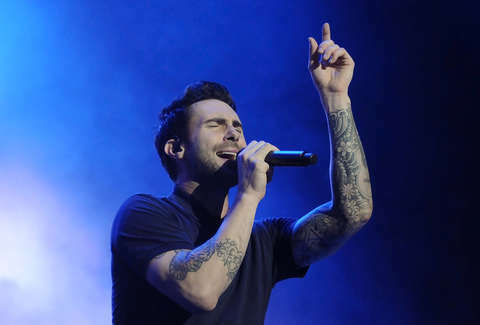 Maroon 5 has put a bunch of pop songs -- "She Will Be Loved," "Moves Like Jagger" among them -- over a bunch of years. Travis Scott is probably best known for his banger-turned-meme "SICKO MODE." And Big Boi (aka Daddy Fat Sax, aka Lucious Leftfoot, aka Billy Ocean, aka Francis the Savannah Chitlin Pimp) was a member of OutKast and is one of the best rappers ever. This is all a bit more complicated this year though. Over 11,000 people signed a petition asking the artists to back out as a gesture of support for Colin Kaepernick, the ex-San Francisco 49ers quarterback who ignited the #TakeAKnee protests against racial injustice in the United States. Rihanna actually turned down an offer to play in reaction to the NFL's treatment of Kaepernick and the issue at large. What time is the halftime show? Unfortunately, there's no exact answer to this. Kickoff will take place at 6:30pm on February 3. But then there will be two 15-minute quarters, and who knows how long those will last because football time works a little differently than normal time -- you've seen football before, you get it. Do Super Bowl performers get paid? Surprisingly, performers usually aren't paid a dime and instead take as compensation the immense amount of exposure and spikes in record sales that inevitably follow so high-profile a performance. Fox reports that Justin Timberlake's sales, for instance, rose 534% after last year's show, and before that Lady Gaga received a 1,000% increase. That's also changed this year, though. Travis Scott would only perform if the NFL donated $500,000 to Dream Corps, an organization dedicated to social activism. Maroon 5 followed suit and just announced a $500,000 donation to Big Brothers and Sisters of America. How long is the halftime show? Like nearly everything else about this event, it's hard to answer this precisely. But most halftime shows in the past decade or so has been around 13 minutes, according to Elite Daily, so it feels pretty safe to assume that it'll be right around 13 minutes. After that, we've heard there might be more of the football game or something?